You all know that Ben brings his lunch to school everyday, well, if you didn’t know already, you do now. We do this for several reasons, first and most important is that we have complete control of what he gets to eat, meaning a healthier lunch meal, and second, it costs way less than the money he would spend every day in the lunch line at school. 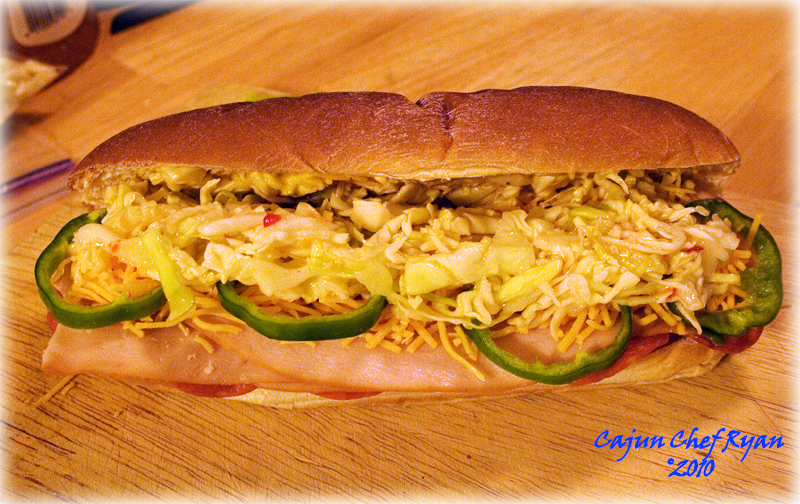 This particular sandwich is a real hit! 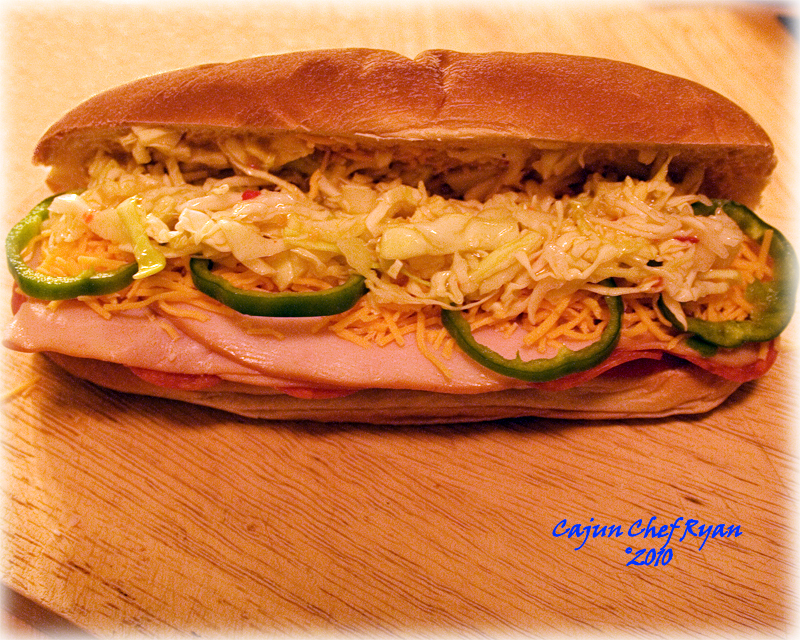 And with the smoked and roasted turkey breast, pepperoni slices, shredded mozzarella or cheddar cheese, Italian dressed coleslaw, fresh tomato slices, and fresh green pepper slices, this sandwich is not only tasty, but has a healthy variety of vegetables also. And not just for school lunch either, this is one good sandwich! The Italian dressing recipe which I have linked goes to a creamy version that I have used from Emeril’s inspiration, it is a creamy Italian dressing, but you can use any Italian dressing you prefer. 1. On the bottom halves of the hard rolls place 3 tomato slices, 8 pepperoni slices, 2 ounces of the turkey slices. 2. 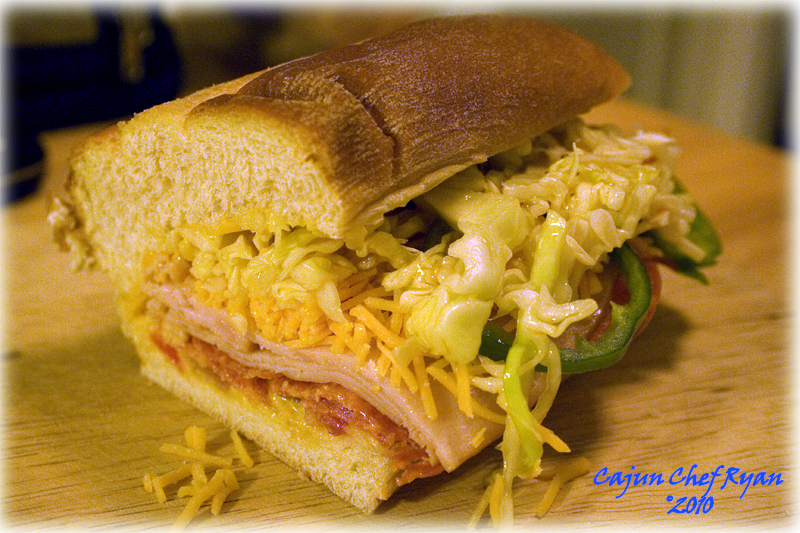 Take the shredded mozzarella, shredded cabbage or coleslaw mix and the Italian dressing and mix well, then portion half of the mixture onto the top of sliced turkey breast on each roll. 3. Cover with the top half of the hard rolls, and slice each sandwich in half. Serve immediately, or package each half into a zip-type bag and place in the lunch kit with an ice pack to keep cool. Love this and what awesome shots here! I love this! It looks amazing! I do love the Italian dressing that you made. Sounds amazing. Wow, that sounds really good. Do you deliver? That sure beats the meatless Red Beans and Rice that they served at Adolph Meyer! Claudia, thank you so much! Faith, the dressing is so much better than store bought. Greg, if I still had a restaurant I would indeed! Hey Greg B, you are so right, every Monday too! That looks delicious! I always forget that I can mix the coleslaw with a light dressing instead of a heavy based sauce. Yum, I know what I am having for lunch! what a lucky boy, this looks amazing! Yummy…I just came home from shopping, and that’s what we are having for lunch! Thank you for the share, Ryan. Well that is great to hear! We do the same thing, Monique and I bring our lunches to work as well, and typically will make enough of a dinner meal to last for leftovers for several days. Saves huge on lunch costs for the both of us, not to mention the other benefits you stated. So important to eat good healthy food at least once a day, saves money & helps the brain work better too. I knew I’d like the look of this sandwich as soon as I read the post title, and I was not mistaken 🙂 Great sandwich, definitely goes against the notion that a sandwich is a fallback lunch! Adore this. You are making this Philadelphian proud!